I love cleaning my garage. Our garage encompasses the place where our cars and boat park, my wife’s clay studio and my woodworking shop. 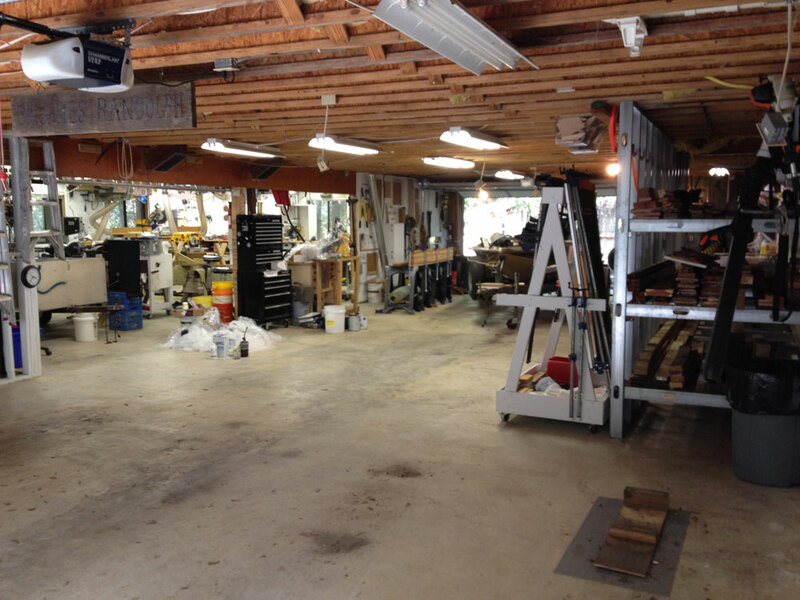 The area we call “garage” includes automobile parking in the foreground, boat parking and wood storage to the right, Brenda’s ceramic studio to the left and my woodshop straight ahead. Steve Johnson and I were talking one day and I mentioned I can walk in the garage in my stocking feet. Steve was shocked! I really like it to be that clean. 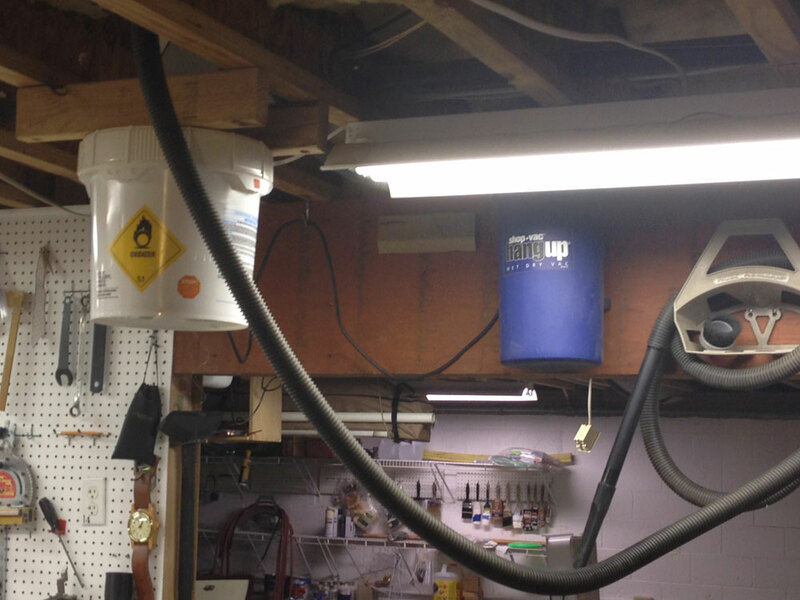 The “garage” is a multipurpose room, that not only does all the things above, but includes a spare freezer/refrigerator for overflow from the house, canned goods storage, a recycle bin for overflow from the house, and the path to the outdoor garbage can. So, it’s not unusual for us to be in our stocking feet when we need some spare food, a screw to fix a hinge, you get the idea. The area closest to the stairs is where the cars, fridge and recycling are located, foreground and left in the earlier photo. Unfortunately, it’s also the area the cars track in leaves and dirt. Living adjacent to a wetland, we are surrounded by trees, so there is a constant influx of leaf debris, and leaves are my biggest cleaning challenge. I’m an all-or-nothing kind of guy. 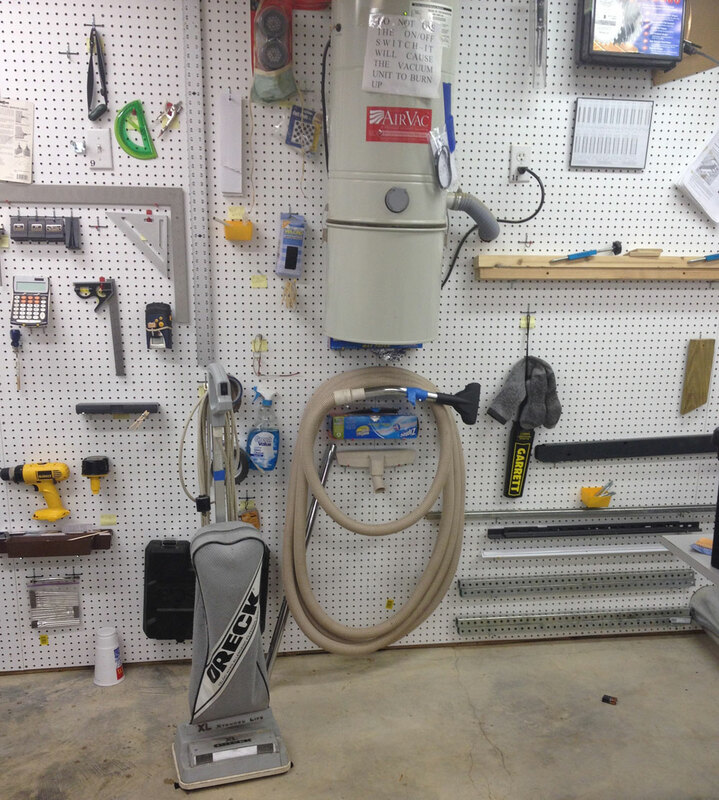 If I’m going to clean the garage, I don’t just clean the woodshop area, I clean it all. If Brenda hasn’t used her studio area, I clean it anyway. For both neatness and safety reasons, big cutoffs and chunks are tossed into a burn container or trash bin as they are created. If chips fall to the floor that are too big for the shop vacuum, I’ll start with a broom and dust pan. The broom is good for leaves, too, and if there are a lot of them I’ll hit the parking area with the broom. I have a super-flexible 2½” hose that keeps my Dust Deputy cyclone separator tight to the vac as we stroll around. “They” don’t make ‘em like this any more. Modern shop vacuum hoses are stiff, and would tend to topple the Dust Deputy over. This soft hose tucks the Dust Deputy in. The homemade cart is bottom-weighted to add stability. An extra section of wand from the pickup hose to the floor attachment saves the back of the tall person from the stooping pain he/she would otherwise experience. Buy enough vacuums over the years and you’ll accumulate sufficient wands to clean while still upstairs! For tall guys like me, three wands are just the right height. 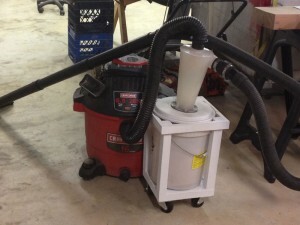 The Dust Deputy prevents almost all of the floor debris from reaching the vacuum. I haven’t changed a filter, or even blown one clean, in years. The pièce de résistance, however, is something you may or may not want to invest in. How much do you like your socks? Our veterinary hospital was once a testing center for Oreck upright vacuums. They would give us their latest unit and challenge us to tear it up. Not a difficult assignment for a place where dogs track in dirt and sand on their paws all day; where hair deposits are measured in buckets, not gallons; and clipped toenail remnants do their best to shatter Oreck turbines. Sometimes we would get a new test model before we wore out the previous one. The used units would go home to the garage, where I learned to be spoiled to an impeccably-clean floor. This Oreck upright is tough! It survived its torture test at our veterinary hospital and its torture continues in our garage. 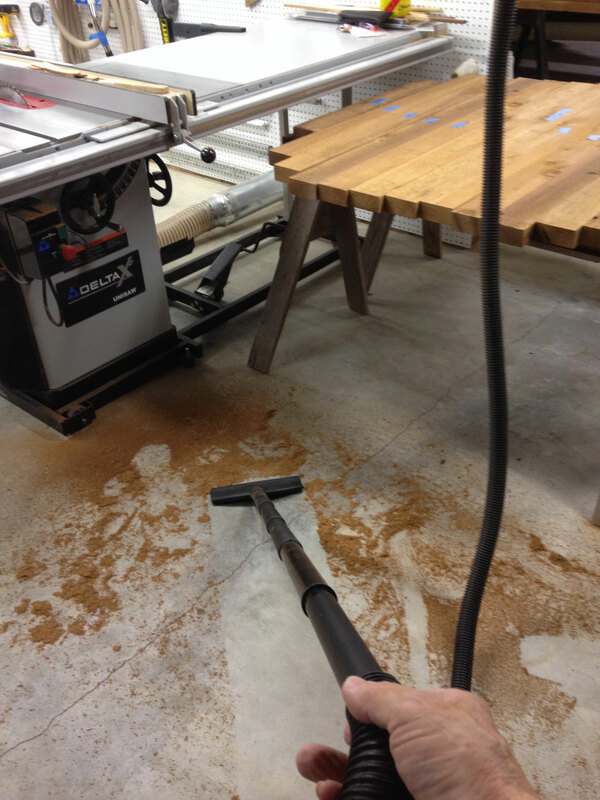 Sometimes I use the whole-house vacuum in the shop, but I worry about getting shop debris caught in the piping, so I usually limit it to picking up dust. I generally clean before starting a new project, do a little spot-cleaning along the way and clean thoroughly again when the project is finished. This Hang Up is connected to a Dust Deputy recessed into the ceiling and is activated by pulling fishing line connected to a switch. Notice the Dust Deputy is mounted on a swimming-pool-tablet bucket. The lid seals tightly and unscrews easily for easy emptying. 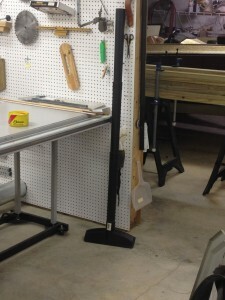 A closeup of the Hang Up/Dust Deputy system. The Hang-Up/Dust Deputy system in action. I can reach nearly the entire woodworking area with the standard hose that came with the Hang Up. Thanks to the Dust Deputy I never have to clean the Hang Up’s filter. 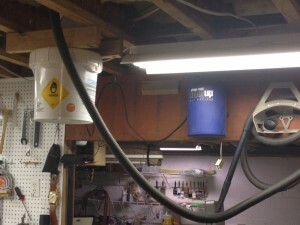 The low-profile bucket preserves headroom in the shop. Work, my “day job,” (and the bugaboo that made Maynard G. Krebs cringe at its mention), sets the pace for how many projects I get to do in a year, so it’s not unusual that the after-project cleaning is no longer evident by the time the next project begins. How clean is your woodworking shop? 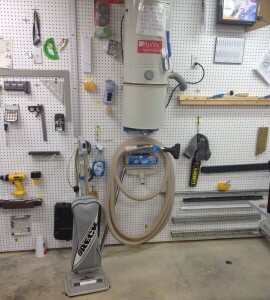 One good shop vacuum and a wide broom take care of all my cleaning needs. Putting tools away when I’m finished keeps the move around time to a minimum. Small shop, but big results. Good idea, Mary, putting those tools away reduces trip hazards and hunting time. It’s hard to be productive when you’re in the hospital, isn’t it? 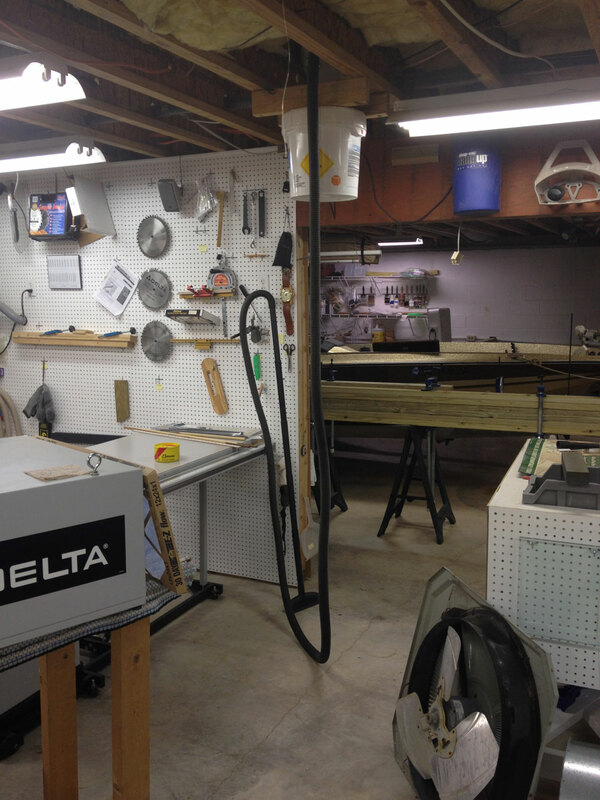 We closed a counter top fabrication business in October and some of what I wanted to keep went into my home woodshop and unfinished basement. Currently, I have stuff everywhere with narrow walkways to get to necessary tools and storage areas of the basement. Where oh where to start with organizing. Vince, I can relate! I went into the shop last night after work to take some photos for February’s poll. I had to twist and turn like a maze. I won’t try to clean up until our youngest grandchildren’s round cedar picnic table with curved benches is finished, but I will be in a similar situation to yours, as my shop is a wreck! I’ll start at the edges and just wade in. Congratulations on retirement, I hope it’s very enjoyable for you. Thanks for reading, Jim.